Metered Parking Lot - Parking spaces facing Arrivals and Departures Terminals. Max. parking: one hour. Short-Stay Parking Lot - near Terminal A.
Multi-Story Car Park - Indoor parking spaces, for short, medium and long stays, sign-posted with letters A, B, C, D, E and connected to the Terminals by pedestrian moving walkways. In particular, the multi-story E park offers the advantage of �long stay indoor parking� for those who stay for 7 days or more; Online booking is available at discounted rates. Executive Parking - Secure parking with insurance coverage for theft, damages and fire for the cars entrusted to the ADR staff. Reception service and assistance: Alitalia and Air-One fast check-in. It is located on level 2 of Multi-story E with moving walkways connecting to the terminals. Online booking. 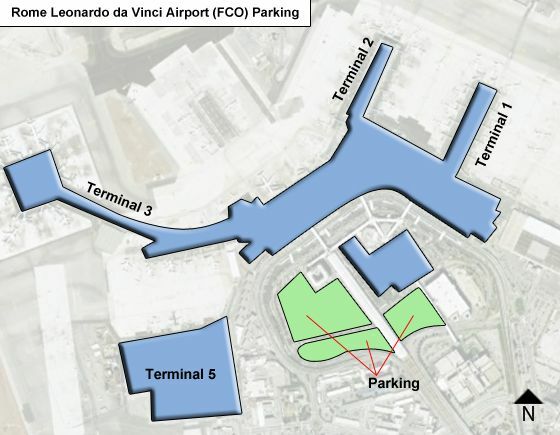 Long-Stay Car Park - You can reach the open air car park directly from the Rome-Fiumicino motorway. Free shuttle bus connections to the Terminals. Online booking at discounted rates. Motorcycle Park - Indoor parking spaces. Entrance adjacent to Multi-story A; moving walkways connecting to the Terminals. Parking spaces for all lengths of stay. Disabled Parking Facilities - available in the Multi-story car park at all levels of module E, at level 1 of modules B,C and D and at level 4 of module D. Disabled parking spaces are free of charge, as established by the law. To take advantage of this service, the permit holder must keep the entry ticket and show it at the exit together with his/her disabled parking permit (original copy) to the personnel of the control room located on the left hand side of the exit in modules A, B, C and D from 8.00 to 23.00 at level 2 of Multi-story building E. Reserved parking spaces are available at the Arrivals and Departures levels of the Terminals, for a maximum stay of 2 hours. by the pre-paid Repark card, which can be purchased at the cashier booth. You can pay directly at the exit bars by EasyPass, is the fastest way to exit from the parking areas; use only credit cards up to 250 euros maximum. For higher amounts, the payment must be made at the cash desks. American Express, Visa, Diners and Mastercard are accepted.